In Twitter, it is important to write interesting things to gain followers, which often will go to our service page to know us better. It is therefore vital that the Facebook profile have an aesthetic that identifies us. Twitter allows customize the profile page with backgrounds and colors. If you want a attractive and merge perfectly, we invite you to try the services of Themeleon, An application dedicated to the aesthetics microblogging network. 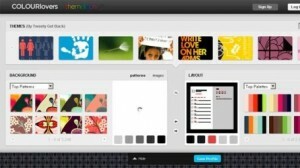 With Themeleon you choose backgrounds and colors that you like for each area of ​​your profile page. Unlike other similar services here you building your profile piece by piece, ensuring a more complete result. To use Themeleon, you need to link with your Twitter account and go to work together. Once you have your topic ready, just simply click on Save Profile and will apply to your profile, giving you a flawless look.